There are two forms of seborrhea: oily (oleosa) and dry (sicca). A combination of both is frequent. A change in the amount and quality of the oily skin secretions (sebum) caused seborrhea. 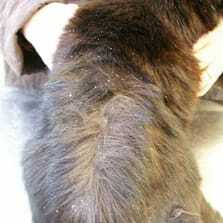 An imbalance between new and dying skin cells causes the flakes on your cat's coat and this aspect of skin peeling. spine pain which prevents them turning around properly. Oily skin exudes a waxy, greasy substance and you may see comedones, often giving cats an unpleasant smell. 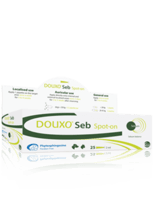 With dry seborrhea, dandruff is more frequent and a lack of sebum irritates the skin. Skin hyperpigmentation and hair loss are also common. The damage to the natural protective skin barrier creates a favourable place for bacterial or yeast infections and itch may appear too. Feline acne is a specific type of feline seborrhea that is caused by overactive sebaceous glands on a cat's chin leading to blocked hair follicles and comedones (blackheads). The affected area can also become infected with bacteria in some cases and may also itch or irritate. Cat's affected with feline acne have thicker more swollen skin due to the changes described - so it's worth checking the skin more closely if you feel your cat has developed a big chin.  Consult your veterinarian to identify and treat any underlying condition. Remedies will depend on the diagnosis. Help control the skin condition by using a specific shampoo, mousse or spot-on product for sebum to soothe and regulate the oily secretions while protecting the skin barrier ecosystem. Maintain a healthy weight, as overweight cats are more prone to hormonal imbalance and grooming problems. Feed your cat a high-quality, balanced diet. Supplement with essential fatty acids, vitamins and minerals can be recommended by your veterinarian if a deficiency is confirmed. 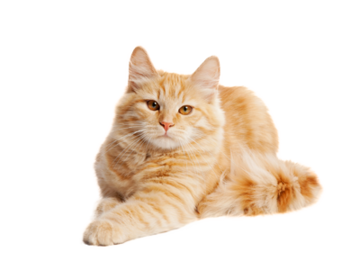 Keep your cat free from parasites: treat against fleas, ticks and worms on a regular basis. Schedule regular check-up consultations with your veterinarian to monitor your cat's skin condition. You can also send him pictures of your cat to show the progress.